Digital DAB radios with image slideshows are currently being trialed in London. For the next two months, DAB broadcasts on stations from Gcap Media , Emap Digital , Switch Digital, Virgin Radio and Chrysalis Radio - including Capital Radio, Heart, Magic and Virgin Xtreme - will feature colour image slideshows. Images featured on DAB Slideshow include station logos, artist photos, information, album covers as well as advertising. James Cridland at Virgin Radio said its listeners tuned in using a multitude of devices, including mobile phones. 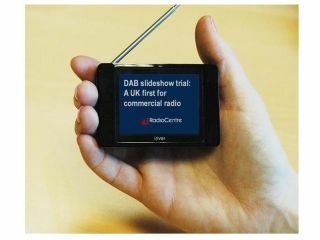 "As screens on mobile phones, DAB radios and portable music devices get increasingly larger, we like to give our listeners an added bonus by displaying information about the songs and artists we play, along with short news clips." Testers taking part in the trial, which started yesterday, have been given a beta version of a forthcoming portable DAB radio from iRiver . It features a colour screen so that slideshows can be transmitted and displayed to the device. "As well as enhancing the experience of our listeners with images to support the programmes they already love, Slideshow means new dynamics for advertisers by adding logos and pictures and more detailed information to radio commercials, and that's a very powerful proposition", said Andrew Harrison, CEO of RadioCentre , the commercial radio association.